German educationist and philosophical writer; born at Dresden Dec. 8, 1818; died in Leipsic Dec. 2, 1890. He received his early education at the Jewish school of his native city, and subsequently entered the gymnasium there, being one of the first Jews admitted to the institution. As his mother was unable to support him, his stay there was short. Asher then learned the trade of carving and gilding, thereby supporting himself as a journeyman artisan during his travels to various cities of Germany and Austria. On the invitation of a wealthy relative he went to London, where he learned English at a private school—subsequently becoming assistant teacher there—and at the same time assiduously studied philosophy, philology, Hebrew, and modern languages. 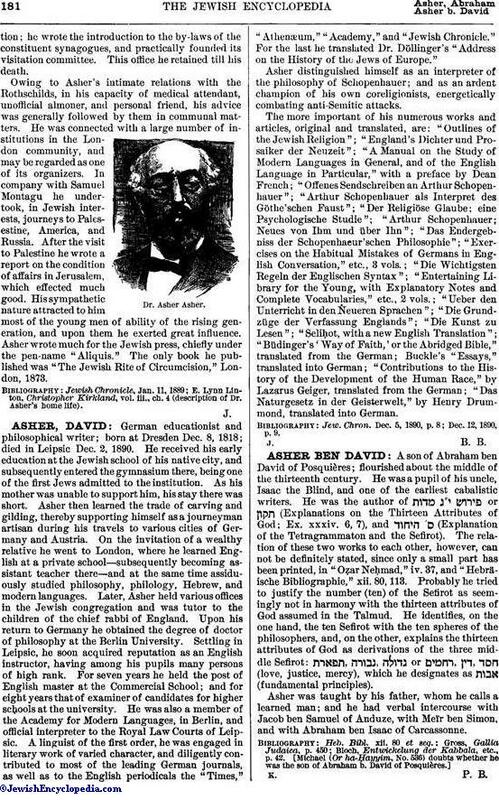 Later, Asher held various offices in the Jewish congregation and was tutor to the children of the chief rabbi of England. Upon his return to Germany he obtained the degree of doctor of philosophy at the Berlin University. Settling in Leipsic, he soon acquired reputation as an English instructor, having among his pupils many persons of high rank. For seven years he held the post of English master at the Commercial School; and for eight years that of examiner of candidates for higher schools at the university. He was also a member of the Academy for Modern Languages, in Berlin, and official interpreter to the Royal Law Courts of Leipsic. A linguist of the first order, he was engaged in literary work of varied character, and diligently contributed to most of the leading German journals, as well as to the English periodicals the "Times," "Athenæum," "Academy," and "Jewish Chronicle." For the last he translated Dr. Döllinger's "Address on the History of the Jews of Europe." Asher distinguished himself as an interpreter of the philosophy of Schopenhauer; and as an ardent champion of his own coreligionists, energetically combating anti-Semitic attacks. The more important of his numerous works and articles, original and translated, are: "Outlines of the Jewish Religion"; "England's Dichter und Prosaiker der Neuzeit"; "A Manual on the Study of Modern Languages in General, and of the English Language in Particular," with a preface by Dean French; "Offenes Sendschreiben an Arthur Schopenhauer"; "Arthur Schopenhauer als Interpret des Göthe'schen Faust"; "Der Religiöse Glaube; eine Psychologische Studie"; "Arthur Schopenhauer; Neues von Ihm und über Ihn"; "Das Endergebniss der Schopenhaeur'schen Philosophie"; "Exercises on the Habitual Mistakes of Germans in English Conversation," etc., 3 vols. ; "Die Wichtigsten Regeln der Englischen Syntax"; "Entertaining Library for the Young, with Explanatory Notes and Complete Vocabularies," etc., 2 vols. ; "Ueber den Unterricht in den Ṅeueren Sprachen"; "Die Grundzüge der Verfassung Englands"; "Die Kunst zu Lesen"; "SeliḦot, with a new English Translation"; "Büdinger's 'Way of Faith,' or the Abridged Bible," translated from the German; Buckle's "Essays," translated into German; "Contributions to the History of the Development of the Human Race," by Lazarus Geiger, translated from the German; "Das Naturgesetz in der Geisterwelt," by Henry Drummond, translated into German. Dec. 12, 1890, p. 9.